This week the WELSTech Podcast focuses on how to do online Bible study and Pastor Tom Koch shares details about a new digital Bible study opportunity. Online Bible Study – Martin and Sallie look at the many forms and tools which can be used to facilitate online Bible study. From live events to extended discussions following traditional face-to-face studies, “going digital” opens up many new opportunities for Bible study. 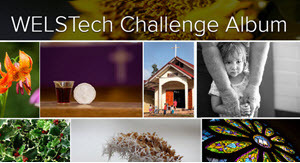 (13:53) Sit at the digital feet – Pastor Tom Koch from Living Word in Johnson City, TN shares details about an online Bible study opportunity which was developed with the goal of allowing more people the opportunity to study God’s Word with some of our synod’s wisest professors and pastors. (42:34) Be sure to grab the WELS ONLINE app for your newest mobile devices! (45:18) Nate Block, Evangelism Chairman from New Hope in Melbourne, FL appreciates our tip on Google Places in Episode 218. Gail Potratz from Emanuel in New London, WI tweeted a link to David Warlick’s The Page is Dead! Long Live Curriculum post. This week on the WELSTech Podcast The Church of Facebook book discussion continues, and Pastor Alan Siggelkow shares his observations of Christians usage of social media. Our blurry social world – Martin and Sallie continue the current book discussion with a look at Chapter 4 of The Church of Facebook where author Jesse Rice compares the adjustment to this new socially connected world to a blind man who regained his sight after 45 years and didn’t know how to interpret all of the new visual input he was receiving. In a similar fashion, with no frame of reference for social media usage, it’s hard to know where to draw the lines in terms of privacy, relationships and time management. (18:26) The Christian and social media – Pastor Alan Siggelkow, who serves as the chairman of the synod’s Committee on Mental Health Needs and works as a counselor for Wisconsin Lutheran Child and Family Service, chats with Martin and Sallie about the positive and negative ways that social media can be used by Christians. Listen to the Internet Toolbox for Churches podcast to learn how. (48:52) Dave Huep suggested listeners create passwords which remind them of spiritual blessings. Teacher Ryan Rosenthal from Faith in Fond du Lac, WI shared a link to 16 of the best Internet Safety Sites for Kids from iLearn Technology. Teacher Paul Patterson from Peace in Sun Prairie, WI shared information about a special from InfoCor on interactive StarBoards which work on existing white boards. Special pricing is $189 with coupon code 121911_StarBoardLink. This week the WELSTech Podcast includes a special anniversary celebration, and the discussion topic is optimized web browsing. Kicking off year 5 – Martin and Sallie look back at the WELSTech beginning in January 2008 and look forward to a new series – “7 Best” – for 2012. What has your browser done for you lately? – Martin and Sallie share their personal browser settings and tips so you can start your new year with a supercharged browser. (42:22) Logos web developer, Mike Hanson, reminded us that The People’s Bible from Northwestern Publishing House is available for the Logos software. Pastor Steve Daley from Petra in Sauk Rapids, MN appreciated our recent podcast on Schoology. He’s using Schoology to connect in one place with his public and LES Catechism students. Teacher Ryan Rosenthal from Faith in Fond du Lac, WI is shared a link on the WELSTech Listserve to an article which explores the possibility that the concept of “Digital Natives” is a myth.